KYAB YUL-SA is the title of a singular artistic project : a musical journey through traditional musics, which are revisited, to constitute the starting point of original and contemporary compositions. KYAB YUL-SA was born after the meeting between Lobsang Chonzor, a traditional tibetan musician, Youenn Rohaut who plays musics from Northern Europe, and Julien Lahaye who plays the traditional instruments from Middle-East and more particularly from Iran. LOBSANG CHONZOR was born in exile in India. As a child he received the heritage of an ancestral culture from his parents and tibetan Masters and as an adult, Lobsang Chonzor decided to dedicate his life to the living Art and by his artistic gesture, to carry his native country Tibet. 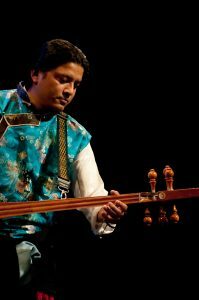 Between 2000 and 2007, with Gangjong Doegar, he participated in tours in India, Bhutan, Russia, Great Britain and Europe, as a group or as a soloist. Since 2008 he’s living in France where he impulsed many artistics projects. 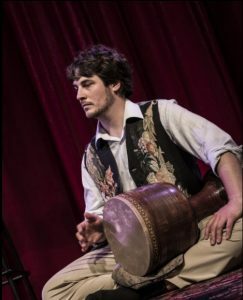 JULIEN LAHAYE is a percussionist. He studied the fascinating playing of Iranian drums (Tombak, Dayreh, Dâf) with Madjid Khaladj in Paris but also with Djamshid and Keyvan Chemirani. YOUENN ROHAUT began to study traditional Breton and Irish music with Christian Lemaitre and Jacky Molard. After his classical studies in conservatory he studied in the Paris region at the Didier Lockwood Music. 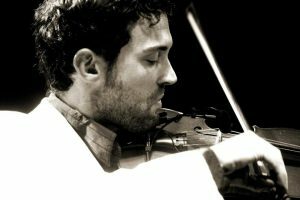 In 2013 he won the “Improvisation prize” at the International jazz violin competition “Stéphane Grappelli” in Calais (France). Currently he is a member of the fifth collective of the Kreiz Breizh Akademi under the direction of Erik Marchand and Hélène Labarrière, he also plays with different artistics projects like : Oihanna 4tet, l’Oscar Delgar, Egon.